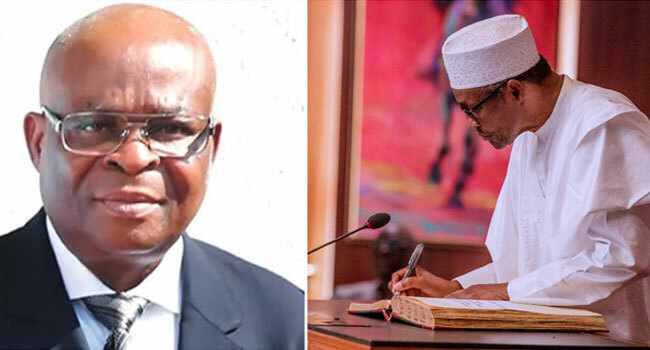 President Muhammadu Buhari on Friday suspended the Chief Justice of Nigeria (CJN), Justice Walter Onnoghen. The President appointed Justice Ibrahim Tanko Mohammed to serve as acting CJN. Below is President Muhammadu Buhari’s full statement on the suspension of the embattled Chief Justice. 10. Nigeria is a constitutional democracy and no one must be or be seen to be, above the law. Unfortunately, the drama around the trial of the Chief Justice of Nigeria has challenged that pillar of justice in the perception of the ordinary man on the street. For it is certain that no ordinary Nigerian can get the swift and special treatment Justice Onnoghen has enjoyed from his subordinates and privies in our Judicature. 13. As you are all aware, the fight against corruption is one of the tripods of policies promised to Nigerians by this administration. Needless to say that it is an existential Policy which must be given adequate attention and commitment by all the three arms of government. The efforts of the Executive will amount to nothing without the cooperation of the Legislature and especially the Judiciary. 16. It is against this background that I have received the Order of the Code of Conduct Tribunal directing me to suspend the Chief Justice pending final determination of the cases against him. It also explains why I am not only complying immediately but with some degree of relief for the battered sensibilities of ordinary Nigerians whose patience must have become severely over-taxed by these anomalies. 18. Accordingly, I hereby suspend the Honourable Mr Justice Walter Nkanu Samuel Onnoghen, GCON as the Chief Justice of Nigeria pending final determination of the case against him at the Code of Conduct Tribunal. 20. Fellow Nigerians, we can only stand a chance to win the fight against Corruption and position our dear nation for accelerated development when we stand together to contend against it.